(CNN) -- After several delays, the trial of Myanmar's pro-democracy leader Aung San Suu Kyi entered its final phase Friday as her lawyer delivered closing arguments under tight security at Yangon's Insein Prison. Only Suu Kyi's lawyer delivered a final argument Friday. Arguments by lawyers of the others charged were scheduled for Monday. Suu Kyi, 64, was charged with breaching the terms of her house arrest, which she has been under for 14 of the past 20 years. If convicted, she faces up to five years in jail. The 1991 Nobel Peace Prize laureate and two of her household staff have been charged in a May 3 incident in which an American, John Williams Yettaw, 53, swam across a lake to her house and stayed for at least a night. Myanmar's military regime charged Suu Kyi with violating her house arrest by offering temporary shelter to Yettaw. But she said she did not know Yettaw or about his plans and did not do anything wrong. Suu Kyi has been held at Insein Prison since May. The regime denied a request by U.N. Secretary General Ban Ki-moon to visit her, though she was allowed to speak to her lawyers before the closing arguments to go over 23 pages of closing arguments. Several diplomats from Britain, Italy, France and Germany are expected to be allowed into the courtroom, a break from Myanmar's usual closed door procedures. CNN was not allowed to attend the proceedings. 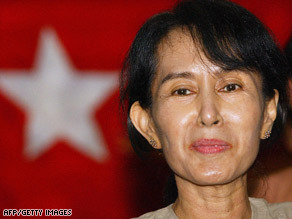 Suu Kyi, the iconic face of democracy in Myanmar, was placed under house arrest in 1989. The next year, the National League for Democracy won more than 80 percent of the legislative seats in the first free elections in the country in nearly 30 years. But the junta disqualified Suu Kyi from serving because of her house arrest and annulled the election results. International pressure to release Suu Kyi has been mounting. At a meeting of southeast Asian nations in Thailand, U.S. Secretary of State Hillary Clinton spoke on Suu Kyi's behalf. "It's so critical that she be relapsed form this persecution that she has been under," Clinton said. "And if she were released, that would open up opportunities, at least for my country, to expand our relationship with Burma, including investments in Burma." The ruling junta changed Burma's name to Myanmar in 1989. The United States still refers to the south Asian country by its former name because it does not recognize the legitimacy of the military regime.